If you asked me to single out one part of the mixing process that gives me the most trouble, it’s bass. Dealing with bass frequencies in general is a frustrating task. Whether it’s bass guitar, or kick drum, or acoustic guitar, or even vocals, those low frequencies can cause all sorts of problems. Over the next couple of days, I’m going to give you some tips for dealing with bass. What’s up with the low end? Don’t get me wrong, I’m not suggesting we get rid of all bass in all of our songs. A well-managed low end is one of the things that makes a mix great. While I do think you should get rid of any excess low end with a high-pass filter, I’m not advocating cutting out the low end entirely. That said, the main reason the low end causes so many problems is that it’s hard to reproduce. Most of use aren’t sitting behind a $5,000 pair of studio monitors. We’re on smaller monitors or headphones. Bass frequencies need a big speakers to accurately reproduce them. Headphones do not have big speakers in them. So what ends up happening is we mix for hours, and it sounds good to us. In reality, though, our monitoring system isn’t letting us hear what’s going on in the lows. You finish the mix, then take it over to your father-in-law’s house to listen on his surround sound system in his living room, the one with the subwoofer. You pop in the CD, and your head drops in shame. “But it didn’t sound like that in my studio!” you complain. True. It didn’t, because your studio simply couldn’t reproduce those lowest frequencies. The truth is, the subwoofer didn’t add low end to your mix, it simply revealed the low end that had been there all along. Please don’t think that I’m suggesting you need to immediately go out and buy the biggest studio monitors you can. Big monitors introduce their own set of problems. You can create a GREAT mix on the system you have right now. You can, but you need to be aware that your system does not always accurately represent the audio. You must learn how to mix on your system. This means you need to do a lot of listening. 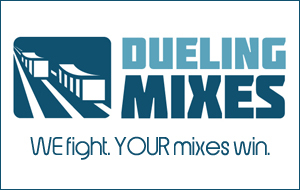 Take your mixes to other systems and listen to how they differ. Adjust your mixing technique accordingly. If you have to crank the bass track in your mix to be able to hear it clearly through your monitors, but the bass is overwhelming in every other system, you need to compensate. The result? Your mix might sound a little thinner in your home studio, but it will translate well to other systems. What does all this have to do with bass guitar? Well, in a typical pop-rock mix, there will be two things holding down the low end – the kick drum and the bass guitar. That’s it. If you don’t get these right, you’ve sabotaged your mix’s low end. That’s why it’s so important to invest a lot of thought into how you’re going to handle the bass in your mix. Has this been your experience? Lots of late nights wrangling your bass tracks into submission? Tell us about it in the comments section. Tomorrow we’ll deal with how to EQ the bass. See you then.